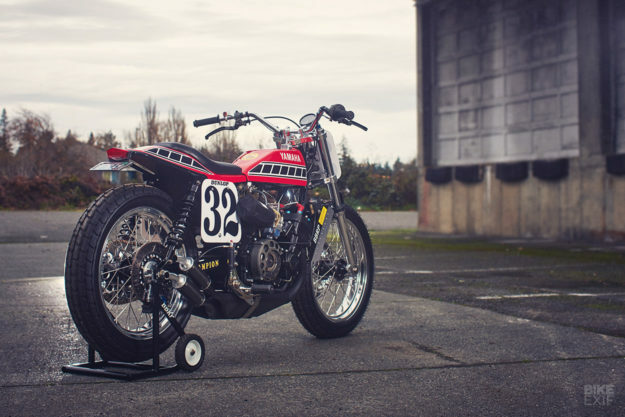 When we were talking to Brad Peterson about his XR750 street tracker a month ago, he let slip that he also had a TZ750 in his garage. And it too was street legal. 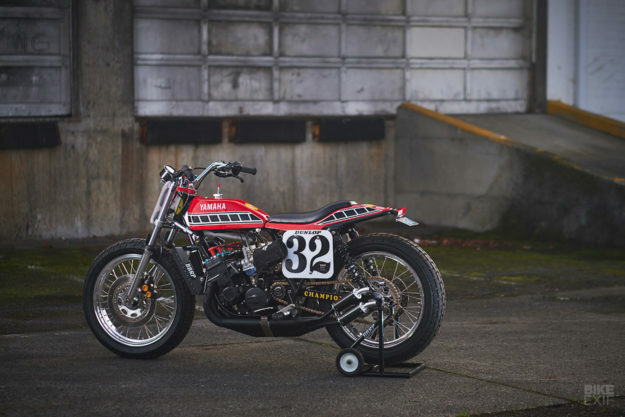 An explosive Yammie two-stroke with classic flat track good looks is too hard to resist, so we just had to show it. But we’re not sure if we want to ride it: Brad may have balls the size of church bells, but we don’t. 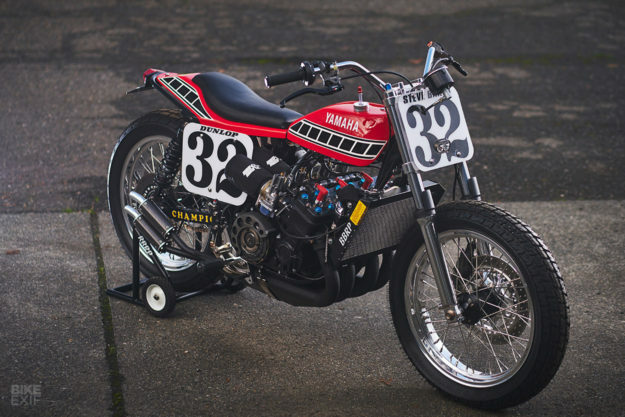 The TZ750 was one of the most extreme flat track racers of all time: it was banned after one race win in the mid 70s, and Kenny Roberts would hit 145mph going down the straights. 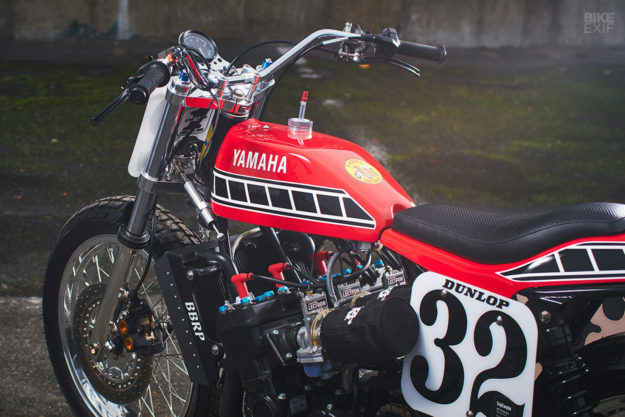 This TZ750 is built around a replica of a Champion Racing frame. 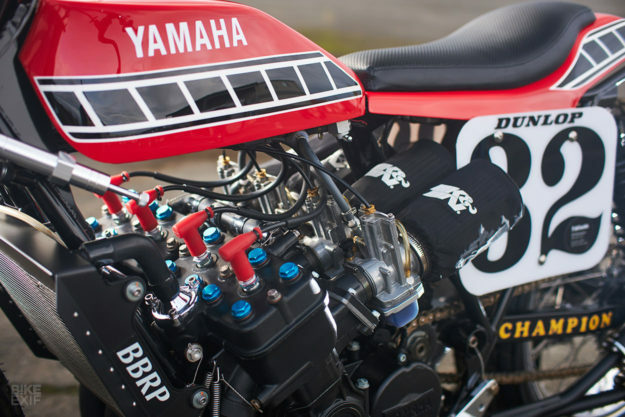 And it’s not any old replica: the original Doug Schwerma design has been replicated and built by Jeff Palhegyi, a man with a very solid reputation in the twin worlds of motorsport and Yamaha tuning. 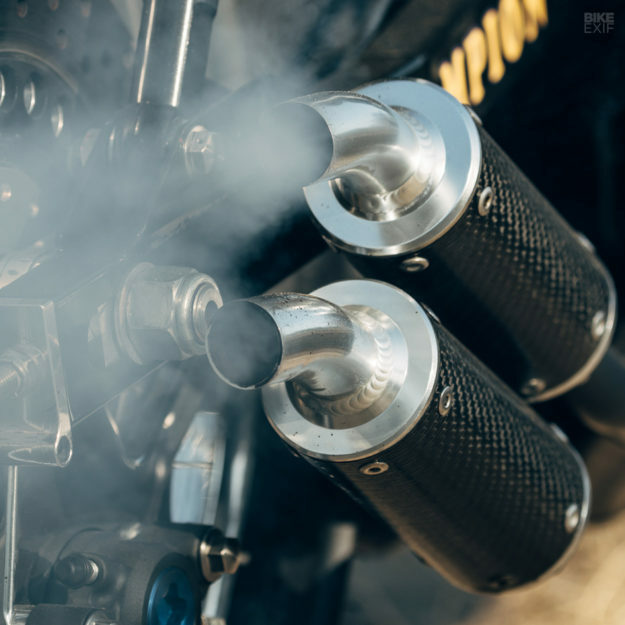 The ‘D’ spec motor got a 30 horsepower boost over its three predecessors, and in stock formed pushed out 120 hp. This one has been outfitted with Lectron carburetors and has been gas flowed and tuned specifically for street use. Those glorious expansion chambers are again Jeff Palhegyi’s work. He’s topped them off with a pair of tiny mufflers from TZ Mike. 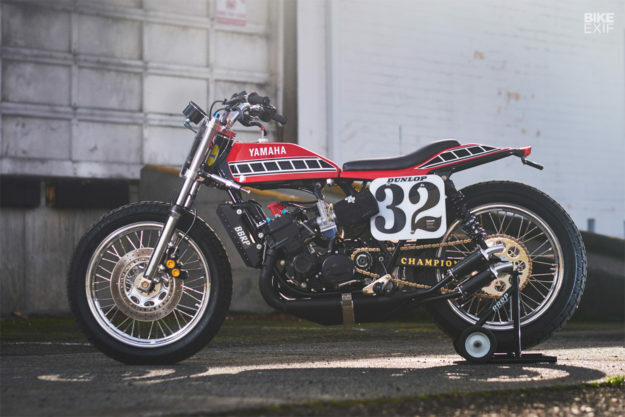 Like many flat track machines, this TZ750 is running Yamaha YZF-R6 forks, mated to the frame with custom triples. An R6 donated its brakes too—including the front caliper, and the front rotor (with a custom disk carrier). Santa Fe Motors supplied the 19-inch rims (shod with Dunlop rubber) and there’s a quick-change rear hub, alongside another R6 caliper and rotor and Race Tech shocks. The bars are from Flanders, one of the oldest names in the bending fraternity, and are graced with brake and cylinder masters from Brembo. The Scitsu tach and temperature gauges are original, though. The low-profile bodywork is by First Klass Glass. 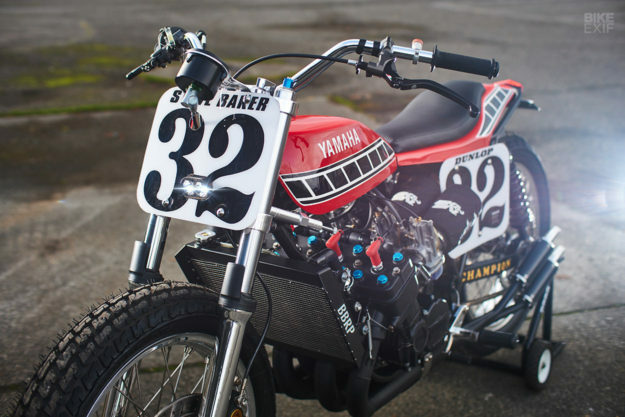 Brad painted it himself—in the Yamaha Canada red colors of #32 Steve Baker, of course. The TZ might be legal to ride on the street, but the power band is akin to a light switch. 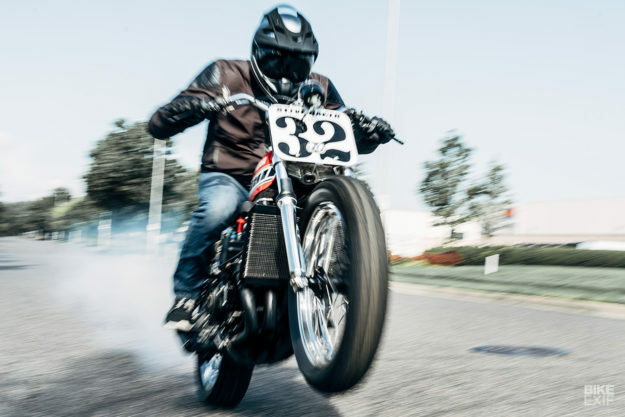 “When the revs hit about 7,000, it lights the back tire up violently—and at the same time lifts the front wheel, pulling hard all the way to 11,000,” says Brad. 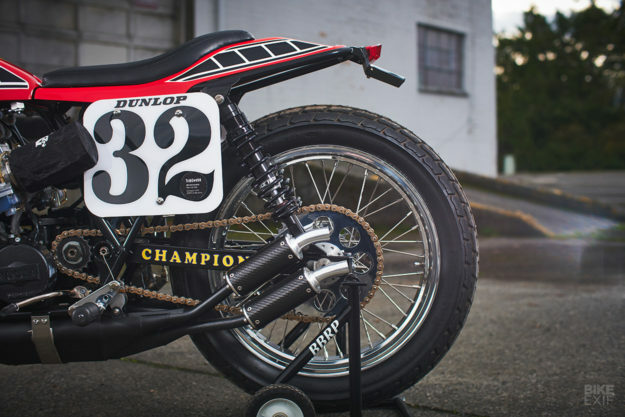 Brad lives in the same town as Steve Baker, who’s still a regular at the small local flat track. 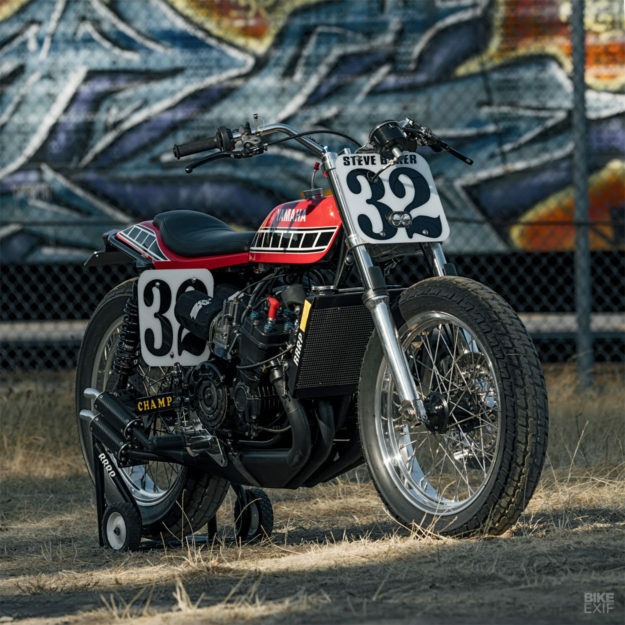 And there are plans in the works to get Baker and the TZ750 together in Canada on a 1/2 mile this summer. We reckon Baker is a brave man, but it should be epic. Images by John Meloy and Pierre Robichaud.